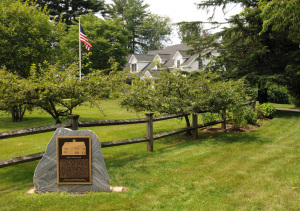 Five generations of the Smith family preceding Joseph Smith, Jr. resided in Topsfield, Massachusetts including Robert Smith, Samuel Smith (I), Samuel Smith (II), Asael Smith, and Joseph Smith, Sr.
Robert Smith came to Massachusetts from England in 1638 and after his arrival married Mary French. He purchased two-hundred-and-eight acres of land which was partially located in Boxford Township and partially located in Topsfield. Samuel Smith (I), upon his father’s death in 1693, moved to Topsfield to what would become known as the Smith’s Homestead. While living there, he became an influential member of the area. Asael Smith, the Prophet Joseph Smith’s grandfather, married Mary Duty, and Joseph Smith, Sr. was born at the Smith Homestead in 1771. Asael then inherited the homestead after the death of Samuel Smith, Jr. in 1785. The original home that was built upon the homestead was razed in around 1875. 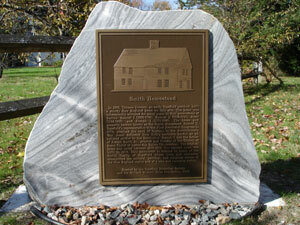 A marker was erected at the homestead in October 2005 by the Mormon Historic Sites Foundation and the Topsfield Historical Society as a tribute to the Smith family. 1 B. H. Roberts, A Comprehensive History of The Church of Jesus Christ of Latter-day Saints, 6 vols. (Salt Lake City: Deseret News Press, 1930), 1: 2. Hours of Operation: The Smith Homestead is privately owned and not open for tours. However, a marker explaining the significance of the site exists near the street. Donald Q. Cannon, “Topsfield, Massachusetts: Ancestral Home of the Prophet Joseph Smith,” BYU Studies, 1973.